“And in the end it’s not the years in your life that count. It’s the life in your years,” as the quote attributed to Abraham Lincoln goes. Although we humans have never been satisfied with the biblical allotment of threescore and ten, neither do we want to extend our life span only to pass the time in a decrepit state. No, we want a longer health span. Might we be on the trail of one? 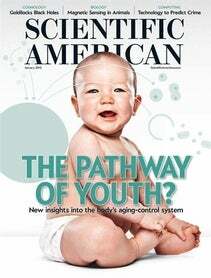 The cover story, “A New Path to Longevity,” by David Stipp, describes intriguing research into a billion-year-old mechanism that slows aging and could postpone the diseases of old age, letting us live healthier lives for longer. The work centers on studies of a protein called mammalian TOR, or mTOR. Interference with mTOR in mice by a drug called rapamycin in three parallel experiments extended life for the rodents by 9 to 14 percent—showing that the molecule plays a central role in aging. At the outset of his career, Ralph M. Steinman first described dendritic cells, later shown to play a crucial role in preventing disease. In “The Patient Scientist,” by Katherine Harmon, you’ll learn how Steinman, diagnosed with pancreatic cancer in 2007, used his own research to extend his life—just long enough to win the Nobel Prize last fall. A lot of life in those years, indeed. If you’ve been following Scientific American’s activities, you know we’re excited about citizen science—the idea that people who are not working scientists can nonetheless actively contribute to research. The Citizen Science tab on our home page at www.ScientificAmerican.com links to lists of existing projects. Now we add an original of our own, produced in partnership with Zooniverse: the Whale Song Project at http://whale.fm. Families of orcas (also known as killer whales) and pilot whales, both members of the dolphin family, have their own dialects. Orcas, for instance, have more than 150 types of calls. Scientists want to categorize these songs to try to understand what the animals are saying. You can help. By clicking on a spectrogram, which shows the shape of a sound, you can listen to recordings made by underwater hydrophones and then decide what categories to assign them to. When you cast your vote that a given song clip sounds similar to another, that vote—along with those of other participants—will help scientists identify sound patterns and groupings, which will assist in understanding how whales communicate. Because whales can sing at frequencies higher than we humans can hear and some clips are short, the songs are slowed down to make it easier to listen to them. So take a virtual adventure in interspecies communication—while you contribute to real science—at http://whale.fm. Stay tuned, too, to learn what citizens and scientists together find out; we’ll report the results in due course.